Vanguard cosplay artist Reika Arikawa will make her US debut in March 2014 at Anime Matsuri. REIKA is better known as one of Japan’s most accredited and infamous cosplayers and is best known for her accurate portrayal of classic male characters. 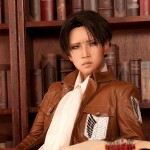 In her cosplay and modeling photos, REIKA cross-dresses as leading male manga protagonists. Her representations of Levi from the anime Shigeki No Koujin (Attack On Titan) and Ren Kouen & Ren Jinguuji from the manga Uta no Prince-sama (Princes of Song), as well as, many others, have sky-rocketed her celebrity to give her a legion of loyal fans across the globe. REIKA also has cosplayed as Howl from the Hayao Miyazaki / Disney film Hauru No Ugoku Shiro (Howls Moving Castle). A well-known featured guest of conventions throughout Asia and Europe, REIKA has made major appearances in Romania, Singapore, Indonesia, Vietnam, Thailand (Bangkok), Myanmar, China, Malaysia, and the Philippines. This talented artist acknowledges her honoree status as an 18 year veteran of cosplay. A almost two decades long list of experience as costumer and make-up effects artist. In stunning representations of beloved male archetypes, she has heightened the competition level, as she has even learned skills like playing soccer, and taking up the violin in emulating these characters. Fans have described her as the highest level of cosplay artist there is and have waited with baited breath for her first trip to the Americas.